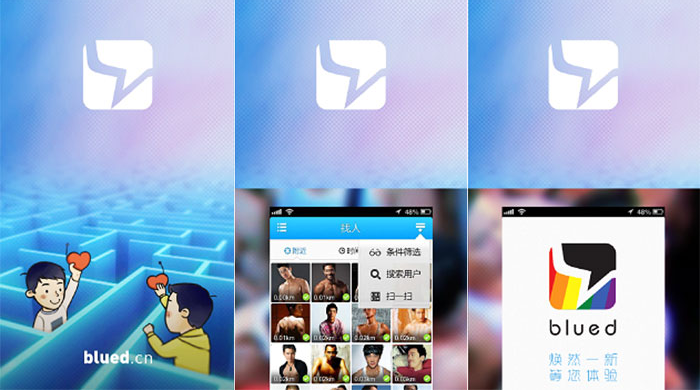 Chinese gay-flirting app Blued received roughly 10 million yuan ($1.6 million) of Series A funding from Crystal Stream for recruiting staff and growing user base, as its founder has confirmed on Weibo. The company has raised 3 million yuan of angel investment from Zhonglu Capital half a year ago. Similar to other dating apps for straight people like Momo, Blued has the usual photo and chat features and enables users to see the pictures and profiles of other people via location-based service. Blued attracted more than 3 million users as of present since its launch last year. The number of daily active users represents around 40% of the total, while monthly active users account for nearly 70% of the total users. Blued is backed by Danlan, a virtual community for gays in China with 3 million registered users as of the end of last year. With 30 employees, the team is planning to develop Pinked, a similar app for lesbians. Founder of Blued Geng Le believes that China has 70 million gay people, creating a $300 billion market per year, according to EuroMonitor International, a U.K. research Institute.